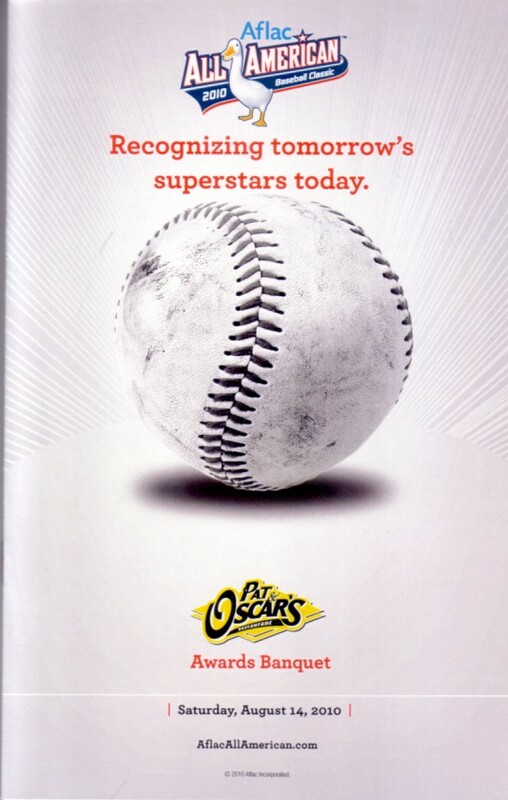 Original program from the 2010 AFLAC High School All American Baseball Awards Banquet (NOT THE GAME), about 5 1/2 by 8 1/2 inches, 12 pages including the covers. The highlight of the banquet is the Jackie Robinson Player of the Year Award presentation. The five nominees are profiled on the inside back cover, and this year's winner was Daniel Norris (projected to be the first high school pitcher taken in the 2011 MLB Amateur Draft). PERFECT MINT CONDITION. PLEASE NOTE: this banquet was by invitation only and had a total attendance of roughly 150 people (including the players). Many programs were discarded or stained. These are extremely rare items, 10 or 100 times scarcer than items distributed at the game!